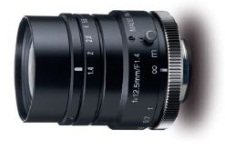 This 1" C-mount lens is designed for near infrared ("NIR") and short wavelength infrared ("SWIR") imaging. Using special coating technology, it has high light transmission across the range of 800 to 2000 nm. Resolution is 120 lp/mm at center and 80 lp/mm in corners.